Left UK 2 days after wedding. Wound up spending honeymoon being sick in Zanzibar carting worldly possessions around to take to Dar es Salaam, Tanzania for four years. Now live in Kenya and have three daughters. 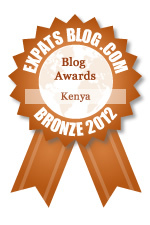 ExpatsBlog.com Expat Blog Awards 2012: Kenya Bronze Award! This blog won the Bronze Award for best expat blog in Kenya!